In 2015–16, honey and beeswax production was valued at $99 million. Around 20,800 beekeepers are currently registered, operating around 647,000 hives. Apiaries range in size from one hive to several thousand. The industry has products other than honey. Australia exports live bees to some countries and our beeswax commands a premium price overseas. Trade relies on the healthy status of Australia’s bees, with beeswax valued highly because it lacks residue from pesticides used overseas to treat Varroa mites. Australia’s bees are further valued for the pollination services that they provide to many plant industries, estimated to be worth $4-6 billion per year, and this is the reason the industry is a member of PHA. 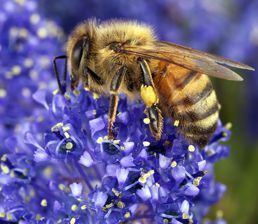 The Australian Honey Bee Industry Council (AHBIC) works in partnership with other industries and governments to protect the health of bees with a number of biosecurity initiatives. The Council contributes to the National Bee Pest Surveillance Program which operates at ports around Australia to provide an early detection mechanism for any exotic pests of bees and pest bees. AHBIC worked with PHA and state and territory governments develop the Australian Honey Bee Industry Biosecurity Code of Practice to protect Australia’s honey bees, which was endorsed by the honey bee industry in 2016. The aim of the Code of Practice is to improve the management of established pests and diseases, as well as increase preparedness and surveillance for exotic pest threats. In addition, the National Bee Biosecurity Program, a partnership arrangement involving Bee Biosecurity Officers in each state is nearing full establishment, with officers appointed in all states except Queensland. AHBIC is currently a part of a national eradication program for Varroa jacobsoni in Townsville in north Queensland. The eradication phase has now concluded and in March 2017 the program entered a three year proof of freedom stage. The honey bee industry is covered by version 1.0 of the honey bee biosecurity plan, which is due for review in 2018, and the Biosecurity Manual for Beekeepers Version 1.1. 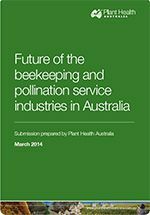 PHA submitted a paper to the 2014 Senate inquiry into the future of the beekeeping and pollination service industries in Australia. Biosecurity planning provides a mechanism for the honey bee industry, government and other relevant stakeholders to assess current biosecurity practices and future biosecurity needs. Planning identifies procedures that can be put in place to reduce the chance of pests reaching our borders or minimise the impact if a pest incursion occurs. The Industry Biosecurity Plan for Honey Bee Industry outlines key threats to the industry, risk mitigation plans, identification and categorisation of exotic pests and contingency plans. The Biosecurity Manual for Beekeepers provides information for the industry and producers about biosecurity practices and honey bee pests. Honey bee biosecurity module – a short awareness course based on the Biosecurity Manual for Beekeepers. It provides an introduction to biosecurity best practice, hive inspections, surveillance, moving hives and how to report a suspect Emergency Plant Pest. 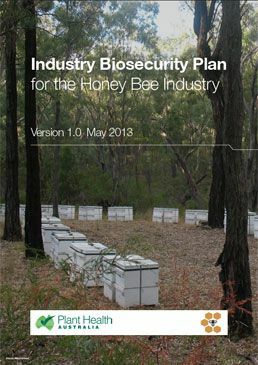 Biosecurity for Beekeepers – provides advice on keeping honey bees healthy using industry best practice. This course supports the Australian Honey Bee Industry Code of Practice and is one way to meet the training requirement of the Code. The potential impacts of a Varroa mite detection, and the ensuing response, on the pollination-dependent industries was investigated at Workshop Acari. Government regulators, pollination providers, and representatives from the beekeeping and pollination-dependent industries interacted with international and Australian experts through a mixture of key note presentations and discussion activities. The workshop demonstrated to apiarists, the almond and other pollination-dependant industries how to prepare for, and act in, an incursion. More information on the workshop can be found in the Workshop Report. 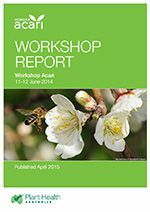 Workshop Acari built on the report Varroa Mite Preparedness of Pollination Dependent Industries. Information about the following projects is available in the National Programs section of this site. 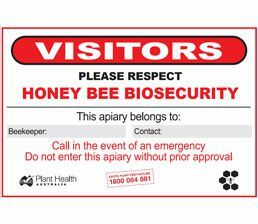 A4 sign that can be staked at each apiary or moved around with each load of hive. 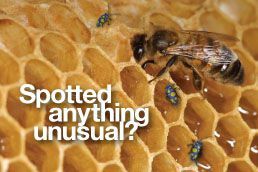 The Honey bee biosecurity threats brochure describes established and exotic pests of honey bees in Australia. The following is a list of high priority exotic pests of honey bees. These pests were identified during the development of the Industry Biosecurity Plan for the Honey Bee Industry in consultation with industry, government and scientists. They have been assessed as high priority pests based on their potential to enter, establish, and spread in Australia (eg environmental factors, host range, vectors) and the cost to industry of control measures. PHA has a range of fact sheets, contingency plans and diagnostic protocols relevant to these pests. Please contact PHA on 02 6215 7700 or email admin@phau.com.au for more information. The following is a list of documents for established pests of the honey bee industry. Please note that this is not a complete list of pests: rather it includes pests for which documents exist in the Pest Information Document Database.